Hello, thank you to those of you who make all this work. I have two Xpenology boxen, both on DSM 6.0.2-8451 Update 9, both using Jun's Loader. One is an i3 and the other an AMD FX6300. Both machines work well and behave identically for purposes of this question. Whatever I do, I cannot find the option to make an SHR RAID. It was present in DSM 5 when I first began messing around with Xpenology, but whatever I do, I don't get the option now. Information is, to put it mildly, nonexistant on this issue. Every Google search turns up plenty of evidence that I should get the option to create an SHR in the first screen of the RAID creation wizard. that show what I see. Disks 11 and 12 are currently in a PetaSpace volume (Volume 1 and Volume 2), but can and will be wiped and added to the SHR if I can find a way to do it. Disks 9 and 10 are ready to use. When I click "Create" in the RAID Group pane, I just get asked if I want a RAID Group for single or multiple volumes. No matter which one I pick, I only get the standard RAID types, no SHR. I see no evidence anywhere that Synology has stopped offering or supporting SHR. I also don't need to be convinced whether or not to use it versus a standard RAID level. That's not really the point - I just want to know where the hell it went. it worked for me, but, why is this option dissabled? 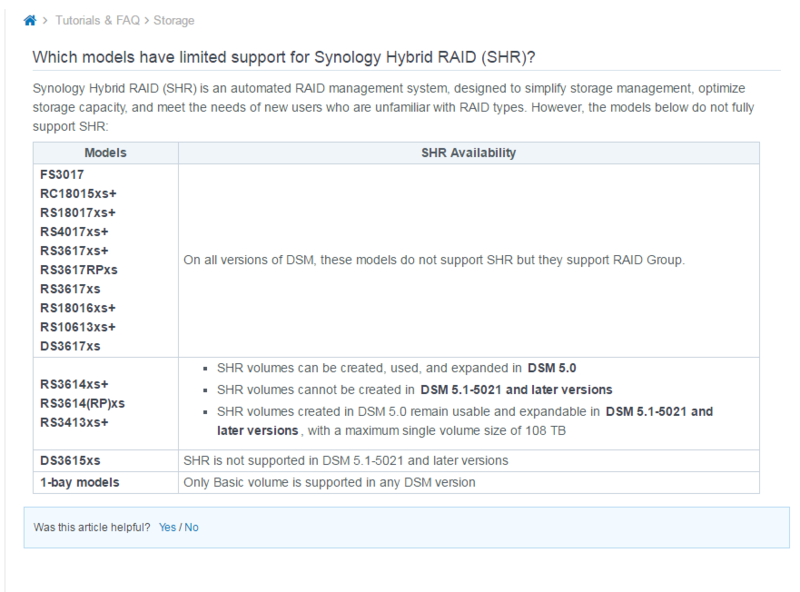 Synology are moving away from SHR on their higher end units, although you can still enable it as mentioned above. SHR still remains the default for most of their models though. So is better not using SHR since Synology is going to deprecate it? SHR was a custom implementation of RAID, with quite a lot of problems. While it provided the most usable space from the array with minimal data protection, data loss was a problem if more than one disk got corrupted in an 8-disk array. OK now i understand. Thank you. But ont DSM 6.1 manual SHR is still there. Just a question, if i made a 2hdd raid1 can i expand it to raid5 if i add one more hdd? Thanks to all those who have put so much hard work into this, especially Jun. I have just succeeded in installing DSM 6.0.2-8451 up to Update 8 using Jun's loader 1.01 onto a Intel Celeron G1840 (Haswell) / 16 GB / Gigabyte H97 / 2 x 2GB WD. My intention is to use this as a home backup of several laptops (and back the server up). Because disk usage will slowly grow, I wanted to use SHR, but it is disabled by default, as noted above. I enabled SSH, connected using WinSCP (which was suggested in another post), and edited synoinfo.conf as described above. However, when I tried to save the file, it said I didn't have permission. I then tried "sudo" in the command line of WinSCP, but that also gave error messages, as did various combinations and permutations of "sudo". Would someone "skilled in the art" be so kind as to post explicit instructions on how to edit and save synoinfo.conf ? This has nothing to do with the network so your problem lies elsewhere. You can either add a # in front of it (that means to comment out) or simply delete the whole line. I always prefer commenting out. Both have the same effect, that is to deactivate the functionality. What kind of instructions do you need for a simple text file? Just open it up, edit what you want/need, and copy it back. I'm still running on my testing server but looking to take the plunge. I did the edits above to enable SHR on DSM 6.1.3. But when I upgrade to DSM 6.1.4, my modified synoinfo.conf gets overwritten and I lose the changes for SHR support. 1) Is there any way to make these changes stick or will I likely face the same issue every time I update? 2) If my SHR system boots after an upgrade with a non-modified synoinfo.conf, is my storage / system at risk? Any insights / speculation would be welcome. 1) No, the changes will need to be made after every new update if you want to ability to create new SHR arrays, if not don't worry about it. 2) An existing SHR will be fine after an upgrade as the changes only allow the creation of new SHR arrays & don't affect existing ones.